Our German Shepherd Puppy’s make perfect family companions, they are Black and Red in Color, Big Boned with correct structure, with superb Temperament. Our German Shepherd Puppies for Sale come Micro-Chipped and with Written Guarantee. Our German Shepherd Puppies are bred with Imported German Shepherds that are V rated and Schutzhund Trained. We are one of the Top German Shepherd Breeders in the United States, that breeds to the German SV Standards. Being a German Shepherd Breeder we take great pride in our selection of German Shepherd Dogs. Our German Shepherds for Sale are often used in a variety of situations. Family Companions, Family Protection, Best Friend and Family Pet, Police Dogs, Seeing Eye Dogs, Guard Dogs, Therapy Dogs and German Shepherd Show Dogs. 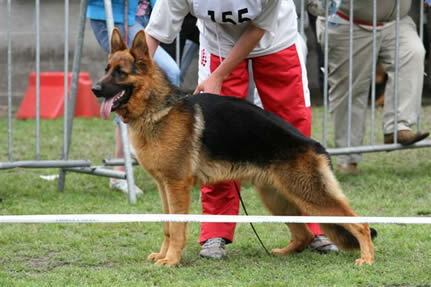 Our German Shepherd Breeding Dogs are out of World Class Pedigree’s. Our German Shepherd Pups are intelligent and have an out going and friendly attitude, and make the perfect family pet. We are a German Shepherd Breeder located in Grand Rapids Michigan, we sell and ship our Puppies Nationwide. We also provide World Class Imported Puppies directly from Germany. Please call for more information: 616-681-2825.